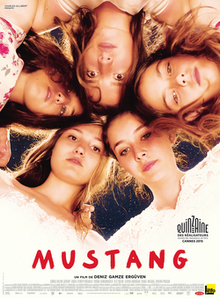 One of the nominees at this year’s Academy Awards for ‘Best Foreign Language Film’, ‘Mustang’ is a powerful film about five orphaned sisters coming of age in rural Turkey. The village they live in is very conservative and religious and there are certain expectations placed on the girls by their grandmother and uncle (who they live with) regarding how they should behave. In one of the first scenes of the film the girls innocently play with some of their male classmates in the sea and they’re spotted by one of their neighbours who reports back to their grandmother. The consequences of this one incident are severe as the girls are removed from school and prevented from leaving the house by themselves, having been seen to shame the family with their ‘inappropriate conduct’. The focus of ‘Mustang’ is on how the girls cope with this situation, and particularly how they react when they come off age and are married off against their will. Seen mainly through the viewpoint of the youngest sister Lale (Güneş Şensoy), ‘Mustang’ is a powerful and thought provoking movie. The film is based on director Deniz Gamze Ergüven’s real life experiences growing up and this lends a real personal insight to the narrative. Clocking in at just over an hour and a half, Ergüven gets her points across in a tight, controlled narrative with no wasted moments. I particularly enjoyed the way the interactions between the sisters are portrayed and the film is particularly successful at emphasising how the restricted environment foisted upon them goes against the natural human need for children and teenagers to develop and express themselves. Whilst there is an element of accepting different countries and culture’s right to live how they choose, ‘Mustang’ is a strong riposte against the culture of arranged marriages and conservatism’s damaging effect on young people. Cinema has always played a major part in shining a light on issues across the world and hopefully ‘Mustang’ may play a part in reopening conversations about its subject matter in the places where changes can be made. The performances are good throughout the cast, with Sensoy, who plays Lale, particularly excellent in the most demanding role. She has to both portray youthful vigour and innocence, yet display a show of strength and fightback beyond her years, and she does so incredibly well. Despite the bleak subject matter, crucially ‘Mustang’ is often funny and it also finds time to be hopeful and suggest the potential for a better future. ‘Mustang’ is an excellent and thought provoking movie with a gripping script that gets to the heart of the issue at its centre, and it’s a terrific debut feature from director Deniz Gamze Ergüven.